People are suffered with the blessing of sun. Temperatures are steadily increasing. The maximum temperature in Nizamabad is recorded at 42.9 degrees Celsius. On Wednesday, the state has registered temperatures. In many cities, hot springs are also beginning. 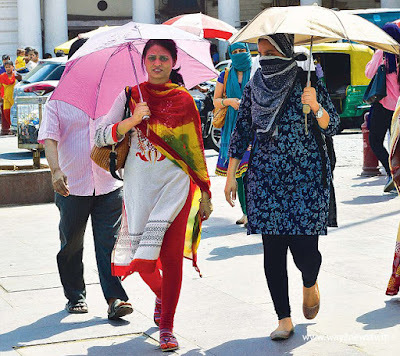 According to the Indian Meteorological Department (IMD) recently, the highest temperature is expected to be recorded in the summer this year. The IMD estimates that temperatures have risen in many places already across the country, but it has been predicted to last for much longer. The IMD said Wednesday that it would have a severe impact on the high heat crop yields and people in the pre-hot summer months of February 28. Nizambad was followed by Ramakundam 42.6 degrees in Adilabad, 41.9 in Mahabubnagar, 41.8 in Bhadrachalam, 40.7 in Medak, 40.5 in Hanumakonda, 40.4 degrees maximum in Nalgonda said. It is noteworthy that the temperature is more than 2 degrees Celsius. The highest temperature recorded in the Khammam was 3.3 degrees. On the other hand, the weather department announced that it will be moderate from the light in several parts of the state during the next four days, Weather director VK Reddy said there is a possibility of rain, thunder, and the thunderstorm in the next Thursday and Sundays.